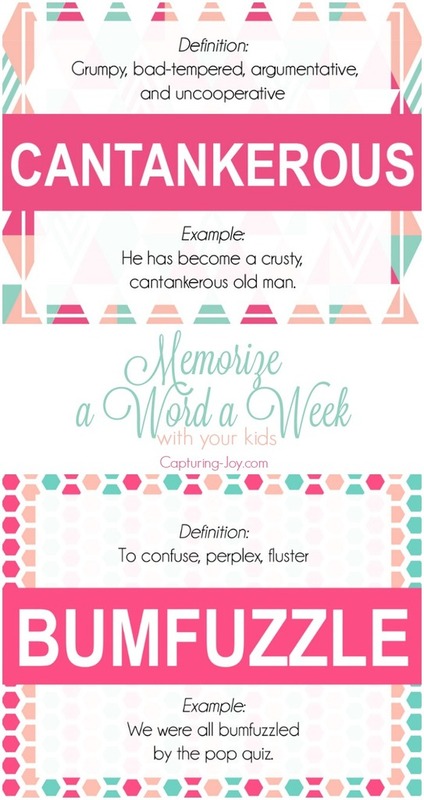 Have you bee playing along with our Memorize series? Last year I introduced memorizing a scripture a month, and this year, it’s a word a week. Some are silly, some are series, all help increase vocabulary for us and our kids (which make us smarter) and it’s a fun activity to do together! I’ve loved hearing from those of you out there that have incorporated it into family fun, and even heard from someone who has a child or two away at college, and they incorporate the weekly words into texting, and make it a game to see who can use it the most. I LOVE it, and great inspiration for me, and a way to stay connected when family is spread out. If you are new to this, read the original post, Challenging Words and confidence in Kids. We display ours on a clipboard in our family room, and change them out each week. I’d love to hear how it’s going for those of you that are participating! If you like this, you might also love over 200 lunch jokes or photo booth printable props I’ve shared, too!